After months of phone conversation, I finally met my Israeli partner Eliyahu, in person. We were near his home in Pardes Hanna and he was covered in mirrors, as a costume for the Jewish holiday of Purim. He told me that he was dressed up as a “reflection of myself.” This, besides being clever, serves as the perfect analogy for my trip. I’ll fast forward through a recounting of all of the the awe-inspiring things I saw in Israel and get down to brass tacks. The story, for me, is about the people. 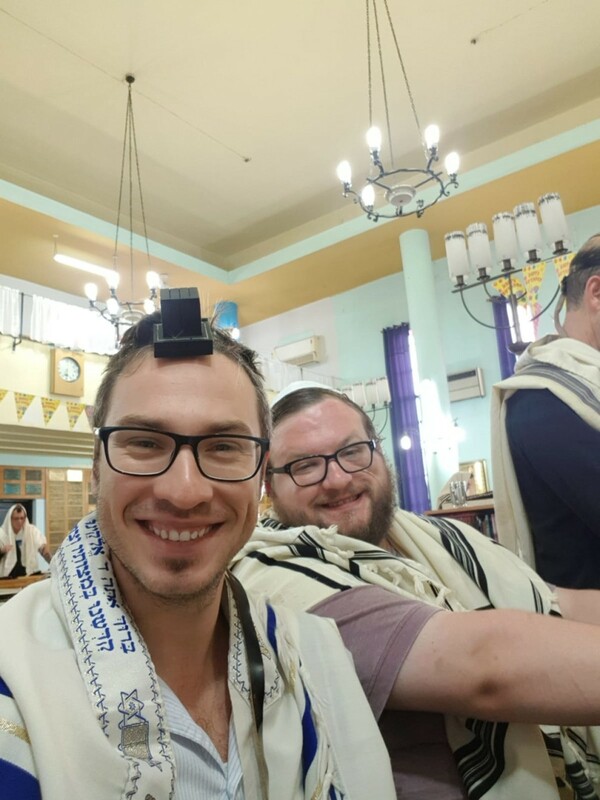 It is easy to forget, while living life here in the South, or while living life in the State of Israel, that "Jewish" also exists in other places around the world, often as something different, but never-the-less connected. Part of the "Leadership" component of that program is figuring out that connection, what it means, how we can support each other, and how we can build together. In conversations with both our Israeli partners as well as with other Israelis, we as Southern American Jews saw ourselves. We saw our Jewish identities, our human imperfections, our beauty, our prejudices, our fears, our hopes, and our love for each other. Our Israeli friends saw the same in us. There were so many ways I saw us in them. Our Southern hospitality was more than matched by my Israeli partner Eliyahu, who not only hosted me in his home, but also sacrificed his bed, cooked me breakfast in the morning, put up with my kvetching about early mornings and walking distances that were short for a veteran of the IDF, but long for me, as someone accustomed to sitting in an office all day. I also noticed that like us, Israelis are doing “Jewish” individually. While they lack for Conservative or Reform synagogues, they engage Jewishly on their own terms. My host was far from Orthodox, yet found time to observe his own traditions on the Sabbath and took me to synagogue for the reading of the Megillah (grogging away at any mention of Haman’s name). For Israelis, like us, Jewish is a malleable and complex idea. For them, however, “Jewish” is also a nationality, and the traditions that for us, seem religious, are for them, part of their national tradition and identity. I would be remiss in my duties as official pot-stirrer if I didn’t bring up politics. I noticed that a few of my American friends seemed to cringe a bit when I would lead conversations towards our national challenges, how we relate to Israel in the context of the Arab-Israeli conflict, or whether or not it is allowed for us as American Jews to be critical of Israeli politics or actions without being labeled as anti-Israel. We had some intense discussions around this topic, which my co-worker Rebecca would call “caring loudly”, but ended with better understandings that each of us care about Israel, and that each of us are operating from within the constructs of our respective national and political narratives and identities. We appreciated each other for and despite of our differences, and could end these discussions as friends, better for having the opportunity to discuss. Lastly, I managed to confirm what I already suspected, which is that the state of Judaism, as an identity or endless plethora of identities, is strong. As I mentioned, Israel has Jews doing “Jewish” in their own ways, regardless of the orthodox influence on government. In our own delegation, we had Jews with two Jewish parents, Jews with one Jewish parent, Jews who married non-Jews and are raising Jewish children, Jews whose partners have converted, Jews who had converted to Judaism, and Jews just beginning that journey. My assessment is that rather than cause for alarm, this is cause for celebration! People want to be Jewish! Our individual interpretations of Jewish identity make us more diverse, more sustainable, and more resilient than ever before. I hope I can repay the opportunity given to me by my partner Eliyahu, the Partnership2Gether Hadera-Eiron-SE Consortium, and Charleston Jewish Federation by better understanding the complexity of my relationship with Jews in Israel, Jews abroad in the diaspora, American Jews, Southern Jews, my own Jewish identity, and those who aren’t Jewish. Let me start repaying by strongly recommending this opportunity to all young adults. All those who participated in this L2G program experienced life-changing moments and conversations, we all made lifelong friends, and we all received an extraordinary gift in the relationships we built with real people in Israel. People with no agenda apart from their personal thoughts and feelings, people who are vibrant and caring; people like us, but with an Israeli accent. Leadership 2Gether is a program geared for young professionals, and just one of many that are part of The Jewish Agency’s Partnership 2Gether program, which creates a living bridge between ten Southeastern Jewish communities and the Hadera-Eiron region of Israel. You may have met the Israeli educators who are working with our local teachers to bring Israeli culture to our children, the Israeli teens who are hosted by our families, the young leaders who study Jewish identity together with our young professionals. Thanks to this partnership, the future of Charleston’s relationship with Israel is stronger than ever. To learn more about this partnership, and even how you can receive home hospitality in the region on your next trip to Israel, contact Rebecca Engel at RebeccaL@jewishcharleston.org.